I was recently contacted by a visionary and compassionate Ugandan, Kenneth Mugayehwenkyi, who co-founded an organization, ROTOM (Reach One Touch One Ministries) about 10 years ago to help the plight of the elderly both in his home community in Kabale District and in Mukono District. Unlike many western countries, Uganda has no universal social security to assist the elderly. It is estimated that over a million seniors in Uganda live in poverty and often live in isolation and with loneliness. It is also estimated that over 800,000 HIV/AIDS orphans are being cared for by these elderly grandparents, whose own sons and daughters have passed away due to this epidemic. Without an income, most of these seniors labour in their small gardens, trying to grow enough to sustain themselves and those they are caring for. Unfortunately, through the conventional farming methods they use, their strenuous efforts often produce very little. ROTOM has had the vision to support the elderly with community initiatives such as assisting with food and income security, medical care, hygiene, improved housing, spiritual and emotional support. Kenneth had heard about Farming God’s Way and was wondering if this might be a tool for the elderly to use in assisting them with their food and income security. After meeting with their staff, we organized two workshops for their community volunteers (many of which are elderly themselves), both in Mukono and Kabale Districts. The workshops included both ‘classroom’ instruction and practical in-field mentoring. The teaching included Biblical principles to assist them in their walk with God, as well as simple technology for laying out and working their gardens, and management principles to guide them in looking after their gardens and planning for sustained profitability. many of the living organisms God created to benefit our gardens – all culminating in poor yields. In contrast Farming God’s Way uses minimal tillage principles in preparing the gardens along with mulching, which protects the soil structure, reduces water and soil runoff, reduces the amount of weeding, and helps to encourage the life in the soil that God created to help the plants gain the nutrients they need to produce healthy yields. Stephen Bwogi, a co-trainer, joined me in the training and was of great assistance being able to translate and train in the local language. He will also be able to do follow up in months to come. This way of preparing their gardens is so different from what they have been practicing all their lives, but it was encouraging to see them quickly learn the principles of minimal tillage. In Kabale District, we trained against the backdrop of the beautiful hills in the surrounding area, and Jerry Amanya, also a Farming God’s Way trainer, was able to join us and help with translation and training. Instead of broadcasting the maize and bean seeds in their fields we taught them how to plant maize in holes – 3 seeds in a straight line, and plant beans in a furrow with the proper spacing between seeds. These are new concepts for them but again they caught on very quickly and voiced excitement in wanting to try this in their gardens. Once the planting was complete we covered the garden with a mulch covering – protecting the soil from excessive soil and water runoff, and providing an ideal environment for soil organisms to help cultivate and enrich the garden. Their enthusiasm was great to see. One of the ladies got up at the end of the workshop in Mukono District and said, “We are giving you a new Ugandan name: Musa (the Luganda name for Moses). Like Moses, you are helping to lead us out of a life of hardship and futility to our old ways of farming, to a more productive and efficient way of working in our gardens.” Stephen and I look forward to visiting with them on many occasions to see how God is helping them use this incredible tool of Farming God’s Way to transform their lives and gardens. Isa 46:4, “I am your God and will take care of you until you are old and your hair is gray. I made you and will care for you; I will give you help and rescue you." 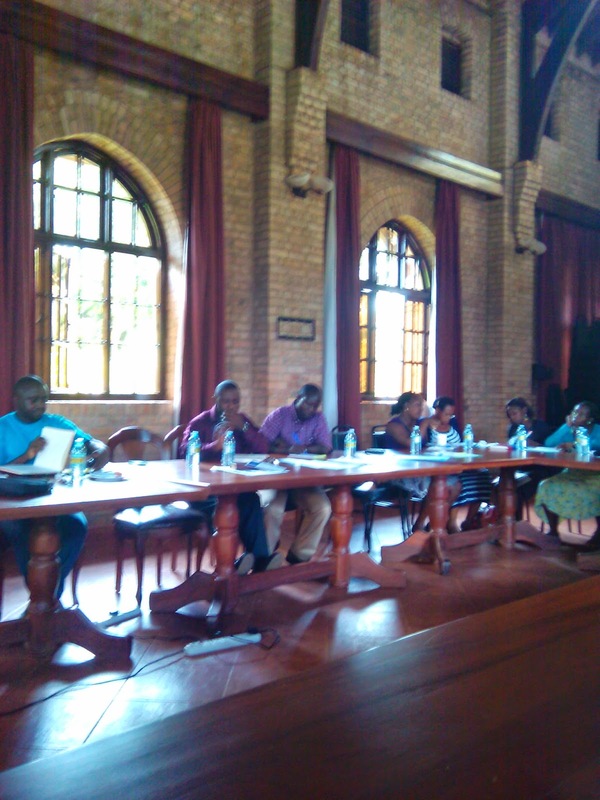 This semester has been busy with training workshops both here at Uganda Christian University and in other contexts. Each one was for a rather specific audience, so required a fair bit of planning, but the variety it good for keeping things fresh. In April we conducted an orientation workshop for new staff, most of whom were administrative and service staff members. 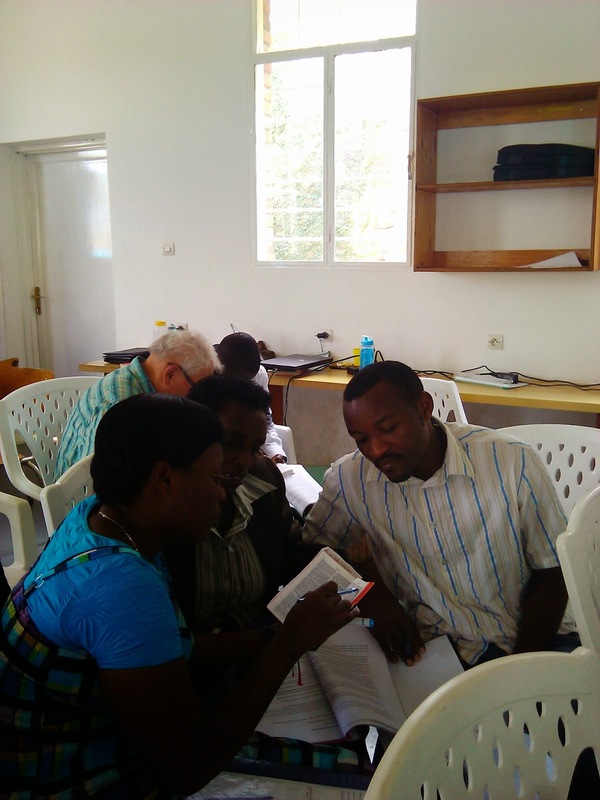 The emphasis was on encouraging each one to understand their job as an essential part of the whole ministry of the university and to approach it from a heart of Christian service.We were pleasantly surprised that a group of new administrative assistants decided to meet regularly to help each other stay accountable in matters of time stewardship, fulfilling their responsibilities with Christian integrity, etc. 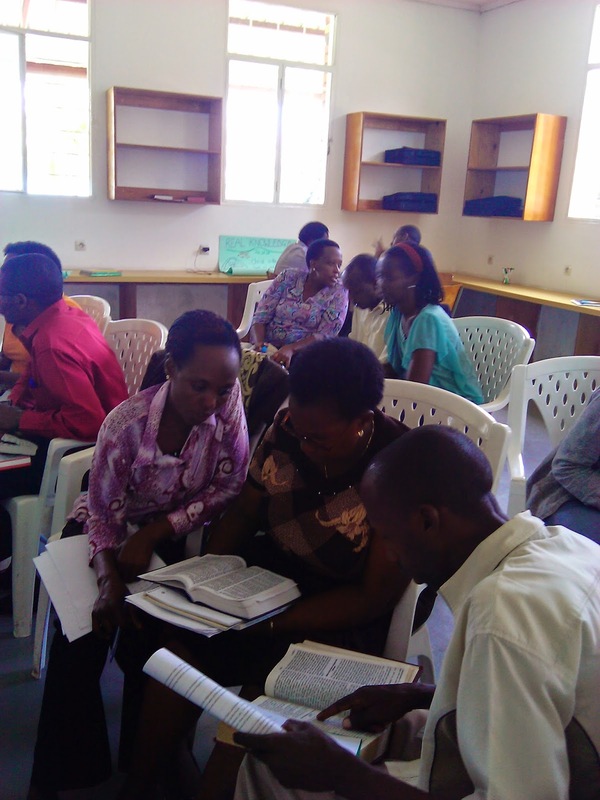 In June, Karl and I spent a few days in Rwanda where he conducted some Farming God's Way training for Prison Fellowship and I took advantage of the opportunity to work with the teachers from Wellspring Academy, a large Christian school in Kigali. Some of the Wellspring teachers had attended the teacher training course at Timothy Centre last year but were not able to continue because the school holiday schedule in Rwanda did not coincide with the Uganda schedule so it was difficult for them to be away during the school terms. They had been asking for someone to come to Kigali and help them with further training so this was a great chance to do that. Of course, it is not possible to condense such an intense course into a two day workshop, but we were able to hit some of the highlights and they were appreciative of the help. It is interesting that some of these teachers have been asked to provide input into the new government curriculum that is being developed for Rwanda because of Wellspring's reputation for being an outstanding school offering quality education. Last week we had a follow-up session with the Faculty of Social Sciences lectures that attended the intensive training we did with them in May. It was good to have time to discuss their challenges and encourage them to keep learning and moving ahead in faith-shaped teaching. They will be doing some work on revisions to course outlines in August so this will be an opportunity to put into practice some of the principles they have been learning. It is not easy for lecturers to start thinking and teaching 'outside the box' of secular humanism that has been the norm for all of their years of education, but some are catching a vision for teaching for critical thinking from a biblical framework. Exciting to see! The next major workshop is for the Faculty of Education and Arts in September. Another opportunity for teacher training has been with a small group of educators that is planning to begin a Christian pre-primary teacher training program called 'Master's Institute of Education'. I was able to share some ideas about working with young children and honoring their unique educational needs to build a good foundation for creative, critical thinking and a love for learning. Unfortunately much that takes place in early childhood education here is very poorly suited to children's needs for learning through play and discovery, so there is a lot of work to be done in this regard. Hopefully I will be able to help with a couple more training workshops for them in the next few weeks. This month we celebrated our tenth wedding anniversary on safari at the Ziwa Rhino Sanctuary and Murchison Falls National Park. It was a wonderful getaway after a few very busy months of work and we were not disappointed by the amazing variety of animals and scenery on our trip. The rhino trek gave us the best viewing of a baby rhino than we had seen before and we were able to watch it suckling. Murchison Falls National Park is worth the visit just to see one of our favorite animals, the giraffe. This lion appeared out of the bush just after we had taken a 'bathroom break'! Then she wandered down the road in front of us in search of good drink from the river. At one point, as it started to rain, a huge herd of over 100 elephants decided to cross the road and we just had to sit and wait. They have the right of way! A couple of them decided to take advantage of the mud and lay down to wallow. ..and then took the boat cruise up the Nile to the base of the falls, enjoying the rich wildlife and beautiful scenery along the shore. Maybe the most unusual sight was this elephant having a nap with his trunk resting on his tusk. Every safari here is a new experience with new adventures and we were blessed to have the time away to celebrate in such a beautiful setting.